February 4, 2014. After I had returned from Texas in January, I took my first tentative steps to search for a new dog. Having reasonably adjusted to Cheyenne’s transition last August, aided by a series of interdimensional contacts, my heart and mind were ready. A fellow pilot suggested that I check out Young-Williams Animal Center, a very reputable shelter in Knoxville. He had adopted a dog there. So, I began checking their website regularly for potential candidates, and also to search elsewhere on the Internet. I was looking for a female puppy, preferably under a year old, and I was particularly keen on mixed breeds of shepherds and Labrador retrievers. 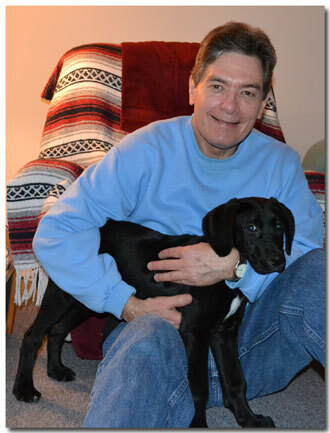 On January 30th, photos of two likely adoption candidates appeared on the center’s website. 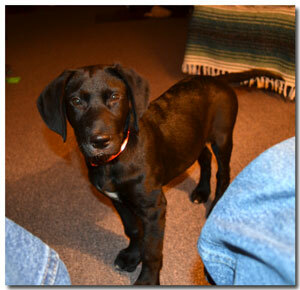 Both were three-month-old Labrador mixes, one red and one black. The energy of the black one particularly caught my eye. So, I decided I would visit the center on Tuesday the 4th, when I would be in town to deliver our newsletter to the printer. 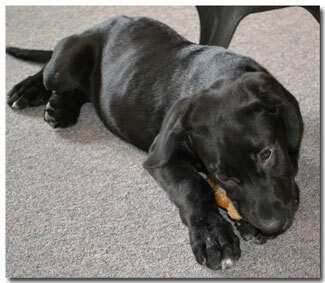 Then, on Monday the 3rd, the red Lab was adopted and her photo was removed that evening from the website. But the black Lab was still listed. So, I added two additional female candidates to “meet and greet” the following day. One was a year-old black Lab, the other a two-and-a-half-year-old red Lab. 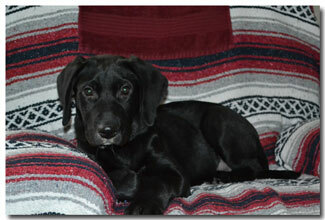 But the three-month-old black Lab remained my top pick. MariLyn accompanied me to Knoxville on Tuesday. After completing our errands, we arrived at the center a few minutes after they opened. One older couple already was in line ahead of us, and I overheard that one of the dogs they wanted to meet was the three-month-old black Lab puppy. Oh, I thought for sure we might have just missed our chance, as they would have first dibs! Yet the caretaker took the couple to meet another dog first. So, when he returned several minutes later, he took us to see the black Lab puppy, which I had listed as my primary choice. Then and there, I decided not even to greet the other two dogs. I felt wholly impelled to make my decision immediately, without delay. I announced that to MariLyn, and added, “Her new name will be Shasta.” (The center had listed her under a different name.) I had received the name Shasta “out of the blue” one day last September when walking home from the barn after work. I had decided then that, if the name and vibration fit the new puppy at the time I would meet her, whenever that would be, I would name her Shasta. I kept the knowledge in my heart and never told a single soul. The name is after Mt. Shasta in northern California, where according to our literature Sananda/Jesus anchored the divine commandment Love God and Love One Another many millions of years ago. * Thus the name, which probably is of Amerindian derivation, evokes a sacred vibration. Love One Another applies also to loving all the kingdoms of God’s creation. So, Shasta will carry the love vibration with her in her new function at I Am Nation headquarters as a loving animal companion and guard dog. Without mentioning me as I stood right there beside them, the receptionist replied sincerely, “I’m sorry, but the black Lab has already been adopted.” The couple, particularly the woman, was crestfallen. With the adoption contract signed, the puppy was put on the surgery schedule to be spayed the following morning, Wednesday the 5th. We could return to pick her up that afternoon after four o’clock. MariLyn and I drove home in a state of utter amazement at the dizzying flow of events. February 5, 2014. In the afternoon, before MariLyn and I left for the Young-Williams Animal Center to pick up Shasta, Robert came to my office to offer me an auric balancing. As he began, I felt the presence of Nada and Dr. Hannibal, working through Robert. He sensed them, as well. With unrestrained love for their student/protégé, they rejoiced at the spiritual fulfillment they had helped bring about in my search for Shasta. Hannibal smiled at me and said, “You have no idea what is about to begin.” He was referring to what he had revealed last August, after Cheyenne’s transition: a new hieronic coordination could begin with the devic-elemental kingdom, including with the animal kingdom as represented by Cheyenne. MariLyn and I drove to Knoxville, picked up Shasta at four o’clock, and returned home around five. Dr. Robert came over to greet Shasta for the first time. We took photos of her in her new home. February 5, 2014. HIERARCHAL BOARD MEDITATION. The same evening we picked up Shasta, we all sat together for our weekly meditation. Just as Cheyenne always had done, as soon as we started saying the Lord’s Prayer to begin, Shasta became quiet and still. She lay down next to me on the couch. The masters were influencing her behavior, and she was entirely receptive. I felt utterly complete and at peace. I gave thanks to all in the spiritual Hierarchy who had helped bring about this wondrous fulfillment. Tears of joy came to my eyes. 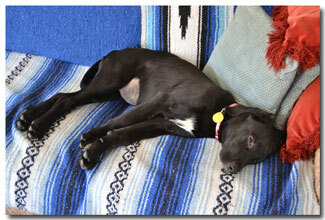 Shortly, Shasta got up, moved to the other end of the couch, and fell fast asleep. Cheyenne suddenly appeared in her astral form. She projected the sweet thought, “See, Daddy, now we have you covered, both from here in the astral and there on Earth.” I watched with amazement as Cheyenne, in her astral form, sat right over Shasta and enfolded her within her auric body. There was a complete blending of their two dog vibrations, astral and physical. I realized then that Shasta had been nudged to get up and lie apart from me so that Cheyenne’s spiritual canine overshadowing could occur without my direct vibrational influence. While I absorbed this wonder, Golden Eagle, the astral Indian chief, materialized astrally and sat on the couch between Shasta and me. He was huge, perhaps seven feet tall. As I sat next to him, the top of my head only reached his shoulder. Also, this time, instead of a single feather as last week, Golden Eagle wore a full chieftain headdress, ablaze with white light. Then, placing one hand on me and the other hand on the combined auric form of Cheyenne and Shasta, Golden Eagle, as a go-between, blended the vibratory frequencies of the astral and physical planes. When Hannibal finished creating the hieronic patches, Shasta immediately got off my lap, moved to the other end of the couch, and fell asleep again. Hannibal signaled that he had impressed her to move apart in order to absorb separately the energies. Then, while Hannibal continued to work hieronically to balance my force field, I became aware of a deva assisting Shasta’s integration. The deva, an intelligent being under coordination of the angels, was one of the group who has charge over the canine species. At the same time, I realized that another deva was working similarly with MariLyn’s cat, Zeke, who remained at home. Clairvoyantly I witnessed the two devas totally merge their force fields. I realized this is the same image we should hold as we help Shasta and Zeke establish a peaceful relationship. Daily, in controlled “therapy” sessions, MariLyn and I have been slowly introducing them to one another. By visualizing a merging of the two devic energy fields, we can readily assist the higher forces to produce the right effects in coordinating the two animals. We want them to interact peaceably before the start of the Mission to India [in March]. Indeed, our microcosmic “test case” to build rapport between Zeke and Shasta has macrocosmic implications for Earthman’s spiritual coordination with the lower kingdoms. 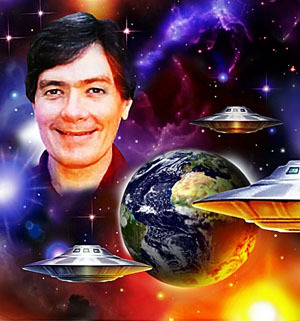 For as light workers we help the nature forces accept and integrate the higher energies of the Second Coming program. Through our specific exampling we are externalizing a higher coordination with the physical animal kingdom, as well as with Cheyenne, Kaileah and Golden Eagle in the astral planes, as indicated in the interdimensional contact at last week’s Hierarchal Board meditation. As Hannibal worked with my force field, Archangels Zadkiel and Uriel overshadowed me, also. Although they did not reveal exactly what they were doing, I sensed that it related to information Zadkiel, St. Germain and Sananda had unveiled to me last August 14th, shortly after Cheyenne’s transition; that is, a greater hieronic coordination to uplift the lower kingdoms would begin. February 14, 2014. MEDITATION. While resting in a chair with Shasta asleep in my lap, I enjoyed a deep spiritual communion with her. Enfolding her in my light body, I projected light into her being. I also sensed my own body deva melding with the deva that is in charge of Shasta, thereby continuing to blend the hieronic patches Hannibal had established between our force fields on February 12th. Then Lord Zadkiel overshadowed both our forms and injected Sixth Ray transmutation energy to help accelerate the process of integration. The communion lasted a half hour. February 17, 2014. DREAM. Cheyenne and I were part of a sizable security detail at the headquarters of a large business corporation. An alarm sounded, alerting the team to an intruder. The security system gave the location, and all of us responded immediately. As it turned out, the intruder was a boy who had scaled the perimeter fence in order to swim in the pond. When he saw us approach, he immediately got out and left. Later, I encountered someone who had ill intentions toward Cheyenne. Interpretation: Obviously this dream alerts me to enhance spiritual protection on all planes. 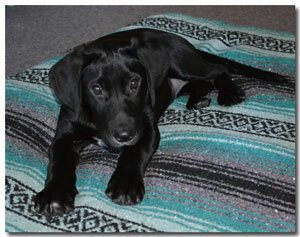 Note, too, that this is the first time I’ve dreamed of Cheyenne since I adopted Shasta. Cheyenne, part of the Astral K9 Unit, remains faithfully on guard from the astral planes. * See Mark-Age text Evolution of Man. 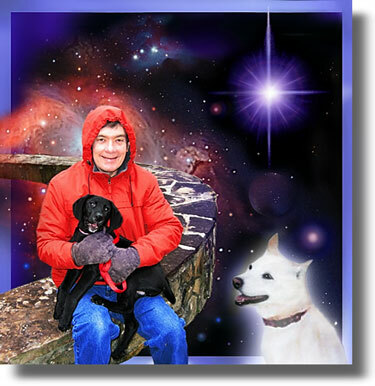 Photos: (1) Phillel with Shasta and astral Cheyenne, 2014, Mark-Age Archives (collage courtesy of Hartmut Jager. (2) and (3) Shasta, 2014, Mark-Age Archives. (4) Phillel with Shasta, 2014, Mark-Age Archives. 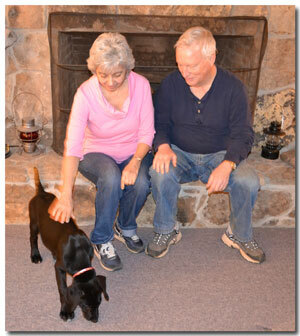 (5) MariLyn and Robert with Shasta, 2014, Mark-Age Archives. (6), (7) and (8) Shasta, 2014, Mark-Age Archives. How wondrous! The wonders of God never, never cease. Even in the midst of the confusion, they become more and more beautiful, full of light, love and the absolute power of our Father. From the littlest to the greatest, we are never forgotten or forsaken. “Come unto me all who labour, and I will give you rest.” “Life everlasting!” Gratitude and thanks to the Hierarchy of above and below. We are truly and utterly blessed. Amen. And so it is! I thank you for all the time you spend to share so many wonderful ideas and parts of your life. I especially loved this story. Thank you.